Celebrated Organic Week with a number of events including the Ontario Organic Dinner Series dinner at the Big Carrot and Organic Roadshow stop at Organic Garage. 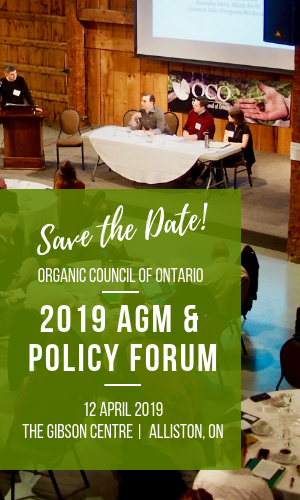 We celebrated Ontario organics, informed on the value or organics and welcomed in over 30 new co-farmer members to help support our advocacy for organic agriculture in Ontario. Arranged meetings with advisor in Premier’s Office to introduce OCO to new government staff. Prepared sector response to GMO Feed study backlash. Identified a theme (red herrings in scientific criticism) and engaged support of scientists, industry and civil society organizations to develop backgrounder documents. Confirmed meeting with Gord Miller, Eco Commissioner, Admin Bonnie Winchester, and DM Karen Chan. Raising profile of organic on edge of new Growing Forward 2 framework implementation this spring. Provided consultation services to Jamie Darves of Katan Kitchens, identifying grant opportunities and helping with the grant process for his research relating to organic production of quinoa in Ontario; Also helping troubleshoot production issues and connecting Jamie to experts in the field of organic soil management. Jamie is our newest industry member and we welcome his innovation in organic agriculture to our membership.